Matt Seymour will bring his on-ice agitating ways to Belgium this fall. "Matty" has signed on with 2009 Belgium Ice Hockey Federation Champions HYC Fintro [link] of Herentals, Belgium as a player-coach. 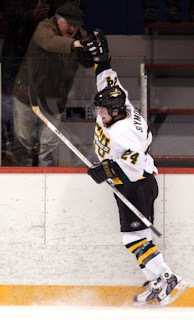 After finishing with the Tommies in 2007 - 2008, Matt was accepted into the Education program at St. Thomas, subsequently graduating with his Bachelor of Education degree. With hockey still in his blood and a desire to experience life overseas, he began to seek out opportunities and found one through former Toronto St. Michael's Majors (OHL) teammate Craig Foster. Matt tells stutommies.com "I told him that I was interested in playing, and he got me in touch with his team. After speaking with them I knew right away it was going to be a great opportunity. I soon found out that they wanted me to play, and also coach. I am very interested in coaching in the future so this made it an even better opportunity." And what an opportunity this is, as Seymour's signing underscores the point that it is possible to earn a university education without giving up on future pro aspirations. Congratulations Matt, for taking care of your future first. As Seymour says "it was a difficult decision to make as I really enjoyed this past school year and I am eager to start my career as a teacher. On the other hand I still feel that desire to play at a high level, and if I do not go overseas I will always wonder 'what if?'". "Once a Tommie, Always a Tommie" - you do the St. Thomas University community proud, Matt. And we haven't forgotten your 5 point night against the Squirrels. Matt's experience should be a lesson for future Tommies' recruits. Attending St. Thomas University gives you more than just a degree. It is "for all the things you'll become". Good luck, Matt and take it easy on the waffles. Matty secured his Education and made good use of his education package,he was good enough to play pro after his Major Junior/MJHL career but was smart enough to do 1st things 1st and it has paid off in spades,congratulations again for setting a fine example for other prospects to emulate. Congrats, Matt. Enjoyed watching you play. Best of luck. That Belgian team has been busy signing former CIS players. This summer they've added Sean Flinn from StFX, Rick Steadman from UPEI and Luc Girard from Laurier. Good Luck in Belgium. I bet the chocolate is good.